A sensational energy filled the air when Kyle Skaggs swiped the then-course record at the 2008 Hardrock 100. “Kyle blew the record out of the water. He came in at 23 hours, 23 minutes, and 30 seconds. We were all so pumped. We were waiting for him, and he arrived hours before the next person,” recalls Megan Finnesy, now the race director of the Golden Gate Dirty 30 and Silverton Ultra Marathon, and whose dawn in the sport of ultrarunning crested when she adventitiously volunteered for Hardrock the year Skaggs won. At the time, Finnesy had never run an ultramarathon and was unaware of Hardrock’s growing reputation. She’d never heard of a race lottery. But when she showed up at a runners’ meet-up where she lived in Boulder, Colorado and heard folks chatting about Hardrock, she felt compelled to get involved. She signed up to manage the Cunningham aid station at 10,400 feet in the San Juan Mountains outside of Silverton—and that kinetic, 30-hour immersion shifted her entire life trajectory. “I had such an amazing, incredible experience that I was immediately sucked into the culture of ultrarunning. 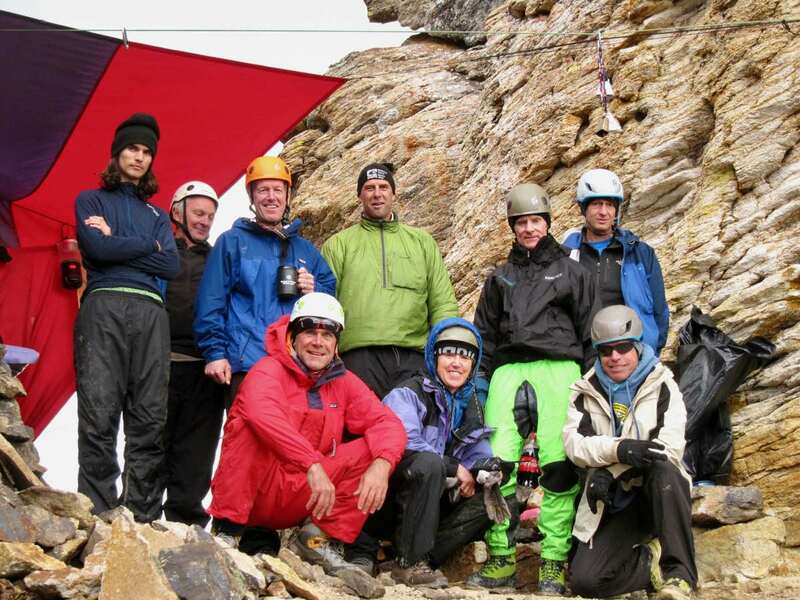 Managing the Cunningham aid station was life-changing,” says Finnesy. In the succeeding months, she decided to introduce a trail running event on Colorado’s Front Range—the now wildly popular Dirty 30—near where she grew up in Boulder. Said race debuted 11 months after her first summer at Hardrock. “My whole mission with Dirty 30 is to challenge people to find new boundaries, set new limits, and do things that they didn’t think possible. And to bring together community. Everything I do pretty much aligns with those goals,” says Finnesy, who went from zero to full throttle. 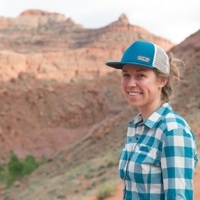 In the following decade, she has expanded her roots in the trail running community as a massage therapist, trail boss, volunteer, ultrarunner, race director, and manager of the Trails in Motion Film Festival in Golden, Colorado. She started organizing trail-boss trainings for people who want to become trail-crew leaders, so that they can guide and direct volunteers on trail-work days. A trail boss learns everything from the basics of first aid to trail specifications, pruning and brushing, as well as trail-tread maintenance and repair, for instance, so that they can pass that knowledge onto other people who do trail work. Finnesy has also coordinated trail-work volunteer days across Colorado. In a handful of ways, her path was a departure from what she expected. In 1992, Finnesy graduated from Fort Lewis College in Durango with a dual degree in psychology and exercise science. She grew up playing basketball and later coached for six years at Boulder High in her hometown and then Gilpin County High School west of Denver. During her college days, a new passion for skiing took over her personal hoop time. She also juggled a work-study position at the Fort Lewis College admission office—a chapter that introduced her to a life-long mentor and friend in Hardrock co-founder and run director Dale Garland, then an admissions counselor there. “I met Dale in 1987 [when I was in college], and we got to know each other. I remember, he helped get me involved in the ski club. He would talk about training for ultras and running the Leadville Trail 100 Mile…. I couldn’t comprehend training for a 100 miler,” says Finnesy. Four years post-graduation, she dove into a thru-hike on the Colorado Trail, which stretches 486 miles from Durango to near Denver. 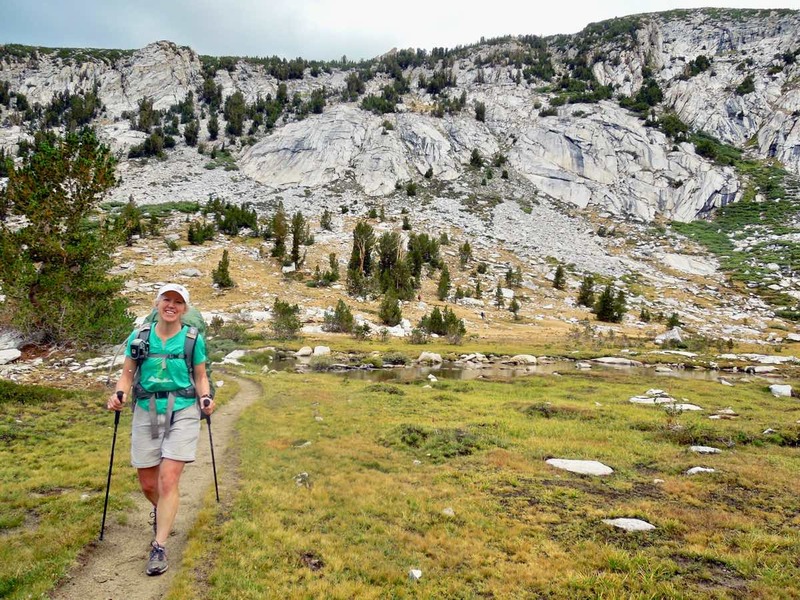 The goal was audacious—she’d never hiked or camped for more than a weekend—but the commitment was manageable. “I ended up doing the trek in 59 days…. I didn’t know people actually did the Colorado Trail in a week or two,” says Finnesy. In fact, Garland had previously set one of the earliest FKTs ever recorded for the Colorado Trail. In 1988, Garland, Dave LaFranboise, John McAward, and John Wolgamott finished the full distance in 17 days. But Finnesy wasn’t gunning for the finish. “I’d lounge and take a day off each week,” she recalls. During her multi-month adventure, Garland brought Finnesy a food resupply on Molas Pass, the high point of the two-lane highway between Durango and Silverton where the trail crosses the road. At that point, Hardrock had reached its fourth consecutive year. “I remember, Dale was talking about race directing Hardrock. I said, ‘Maybe I should help you since you helped me?’ At the time, I didn’t know anything about ultrarunning,” says Finnesy. Karma eventually circled back, eight years later. And since that 2008 race, Finnesy has been hooked on Hardrock. In 2009, she returned to volunteer at the Cunningham aid station again, and she paced Hardrock finisher Andrew Barney for 47 miles—a distance she’d never before covered in a single push. Before that July, she’d completed a few races, in 2008, including the Goblin Valley Ultra 50k, TransRockies Run, and Rim Rock Run. 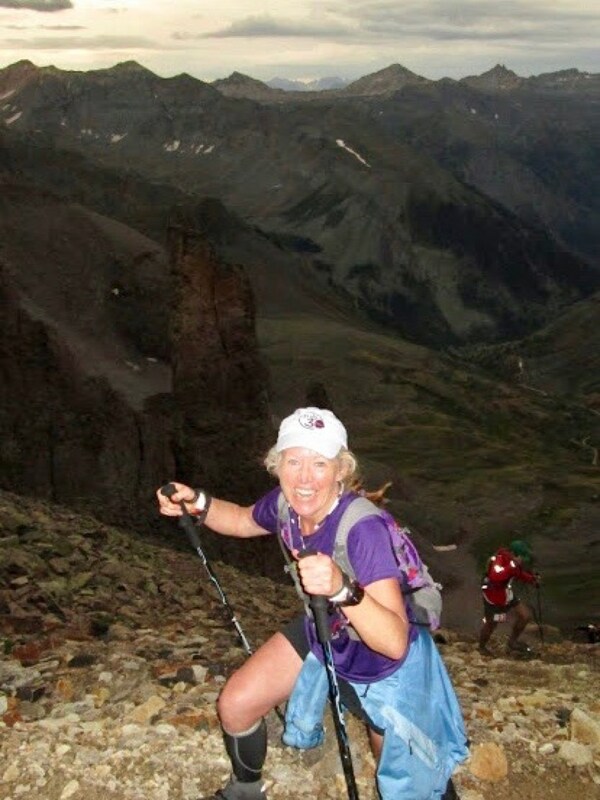 Several years earlier, her first-ever mountain trail races were the 2004 Colorado Outward Bound Relay and the Imogene Pass Run. But she didn’t really train. But run 100 miles? Never, she thought. “When I managed Cunningham, I thought to myself, Me, run 100 miles, are you kidding? I haven’t even run a marathon. After I paced Andrew, I slept the whole next day. But within a week, I wanted to do Hardrock,” says Finnesy. She needed a qualifier, so she registered for the Bear 100 Mile, which was two months later. Again, “I had not trained whatsoever. I wasn’t a regular runner. I ran the Bear and totally wrecked my body, but I was so determined,” she says. Finnesy, unfortunately, didn’t get into Hardrock that year or the year after. She had to complete a second qualifier, the Cascade Crest 100 Mile. With luck, she was drawn in the lottery for the 2012 Hardrock. Clearly, becoming a Hardrock volunteer sparked more for Finnesy than a new endurance pursuit. “Who would’ve thought that volunteering at Hardrock would [lead to] an entire career?” says Finnesy, who attributes her motivations as a race director to her inaugural episode at Hardrock, after which, she dreamed up the Golden Gate Dirty 30, which is held in Colorado’s Golden Gate Canyon State Park, near where she lived at the time. She’d done a couple of trail races, but the majority of those routes covered dirt roads, which doesn’t excite her as much as singletrack adventure. One day, she was hiking in Golden Gate and realized there was enough trail mileage to comprise an entire race distance. “Putting on a race is hard work. What drives me the most is that I like creating a community that is supportive, fun, and energetic. I also like creating a sense of adventure, which Golden Gate provides, because it’s a single-loop race on singletrack,” says Finnesy, who was excited to create a route that was 100% on trails with no dirt roads in the mix. The 50k race has 70 trail junctions, so Finnesy recruited 20 trail marshals to wear silly costumes and help direct racers. Her goal is for races to be both tough and fun. “I want to help foster an anything-is-possible environment. On the Front Range, there’s a huge population and people come out of the woodwork to do this 50k,” she says. The race also draws fast runners who compare their times, year over year. The Dirty 30 evolved into a well-attended event. But that debut year required an enormous workload so that it would take off. The race featured three distances plus a silent auction to fundraise for the Gilpin County Girls Leadership Summer Camp with the Women’s Wilderness Institute. “I posted on the Denver Trail Runners and Boulder Trail Runners pages that this new race was happening. I was so amazed at how people in this community came forward to help me. One woman offered to help me with the website and another guy offered to help me with marketing and advertising,” says Finnesy, who also leans on mentors such as Garland, as well as friends, ultrarunners, and race directors Joe Prusaitis and Tia Bodington. Finnesy met Bodington at the 2008 Mountain R.A.T.S. four-day stage race in Steamboat Springs, where they shared a tent. The following summer, they saw each other at Hardrock, when Bodington was crewing a friend. When Finnesy decided to design a race, Bodington was one of the first people she called for advice. She respected her perspective as a friend and leader in the field. 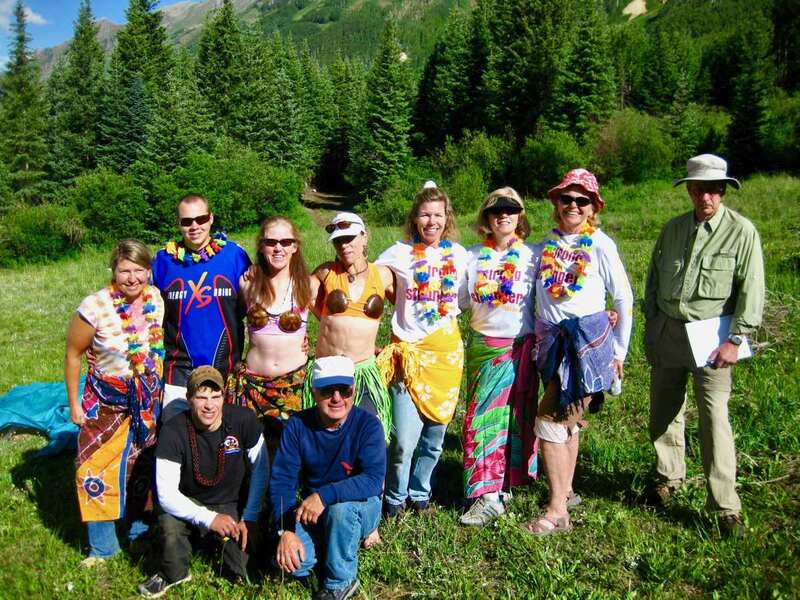 Megan (top row, third from left) and other volunteers at the Chapman aid station during the 2010 Hardrock 100. Photo courtesy of Megan Finnesy. “Megan has always had a very specific vision of how her events will benefit the participants and the community, and she follows through on the tasks that will fulfill that vision. She is willing to be patient, put in the hard work, ask questions, and kick around how to solve an issue until it works,” says Bodington. In 2010, Finnesy moved back to Durango for four years. During that time, she felt inspired to develop another race. “I had an idea to expand Dirty 30 in different locations. The terrain around Durango was more remote than that surrounding the Front Range. Another race would at least need an attendance that was financially viable. So, I was looking for a phenomenal course that would hopefully incentivize people to travel a long distance to participate,” says Finnesy. Ultimately, her vision for a new race circled back to the heart of Hardrock. Introducing the Silverton Ultra Marathon, which Finnesy launched in 2015. “I wanted to follow the Hardrock model with everything I did to design the Silverton Ultra,” says Finnesy. From a management standpoint, a number of the aid stations are super remote, a challenge that intrigues Finnesy. But it took several years for her original idea for a route to be approved by the U.S. Forest Service. Now, it’s here: Starting in 2019, the loop-shaped 62-mile mountain course will finish or start (the direction alternates each year) on 11 miles of the Hardrock course. The route is 97.3% singletrack and climbs 17,000 feet, including three 12,500-foot high points. The route also follows the Colorado Trail for 23 miles. To gain a permit for the race, Finnesy essentially needed to earn the right. So, she trained to become a trail boss, adopted the Rico-Silverton Trail over which the race passes, and organized trail work for five years. “At first, I was so annoyed that I had to do all of this extra work to get a permit. But now I’m grateful and the trail work has taken on a life of its own. I care about these trails and I want others to care. It’s really valuable work, and I feel good about what we’ve done on the Rico-Silverton Trail,” says Finnesy, who also became a trail boss for Hardrock. Since 2015, she’s helped organize the trail-work volunteers before the race. 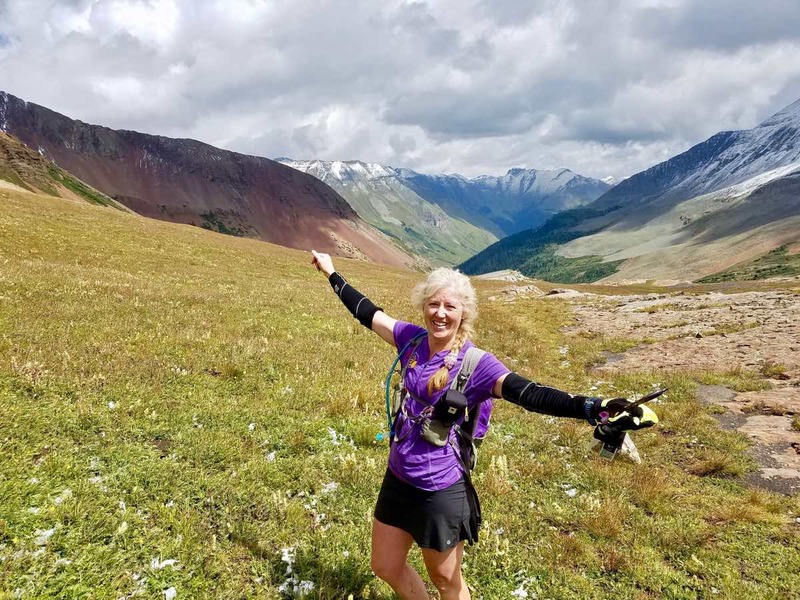 “Megan also has a curiosity that prompts her to see the bigger picture of how a trail race integrates into a community, rather than a race just happening to take place at a given location,” says Bodington, which is true for the Dirty 30 as well as the Silverton Ultra. Megan (bottom row, center) volunteering at Kroger’s Canteen during the Hardrock 100. Photo courtesy of Megan Finnesy. “Hardrock has a huge economic impact, because runners will come for two to four weeks to train. Some racers even buy homes. I hope the Silverton race also becomes a viable resource for the town. Silverton is in its infancy but I have a vision that it will grow and I would like to build a race that attracts 250 runners,” says Finnesy. Up ahead, she also has a vision for the Dirty 30: to increase women’s participation up to 50%. At the moment, 38% of registered runners are women. To help, Finnesy instituted a team option at the Dirty 30. “In general, women participants are not as competitive as men in their endeavors and they’re more cooperative. Now, women can show up as a team and have a collective effort toward how they do,” says Finnesy. Also, at this year’s Dirty 30, women will get half of the start line and men will get the other half. The end-all goal of Finnesy’s races is to facilitate an adventure that challenges people’s perspectives of their own abilities, while also forging a supportive environment filled with new and old trail companions. Here’s your chance to share a Megan Finnesy story! Leave a comment from your experience running one of Megan’s races, doing trail work with her, running a race with her, or something else. Morgan Tilton is an adventure journalist who writes about the outdoors with a focus in travel, industry news, and human endurance. She is a recipient of multiple North American Travel Journalists Association awards including two double-award articles—“Wild & Broken: A First SUP Descent of Utah’s Escalante River” and “A Wild Space”—that share her first descent on stand-up paddle board of Utah’s wild Escalante River, a self-supported journey she shared with four friends. She works with close to 50 publications. Follow Morgan on her website and Instagram account. Hey, it’s great to see “Miss Megan” profiled here! Kudos to her for making the sport what it is! Very happy to say that I’ve not only completed both distances in the Dirty 30, but have also volunteered at the race. All were great experiences in no small part to the personal attention and passion that Megan puts into the race. What a great article! Megan is not only a wonderful person, but she also puts on incredible events. Her love of the sport shows through her careful and meticulous race planning. Her courage to push into the Silverton area as an RD exemplifies her confidence and knowledge of how complex and tough the logistics are in remote areas of Colorado. I hope many ultrarunners have the opportunity to run the Silverton Ultra or Dirty 30 and meet such a wonderful and thoughtful RD. Thank you Megan for being such a great example of leadership and courage in this fantastic sport! Meghan, we are really looking forward to running Silverton next year. You’ve put together a great race out there! Great article Megan. You never give up and Silverton is proof. Congratulations on jobs well done.